Travois are a type of sled attached to either horses or dogs that many Plains tribes use. They are usually made with two large poles. In MNHS collections, we do not have a life-sized travois but a miniature version. This was collected by Gilbert Wilson and his brother, Fred, when they visited the Hidatsa and Mandan at the Fort Berthold Reservation in North Dakota in between 1906-1918. 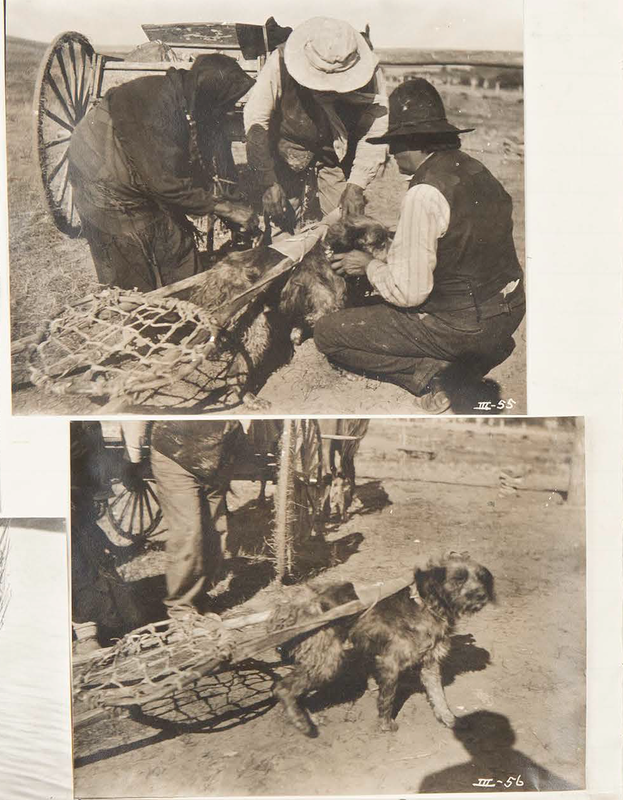 Along with the miniature dog travois, Wilson took pictures of Edward Goodbird’s dog wearing a travois as a demonstration. Edward Goodbird attaching travois on his dog. To learn more about Gilbert and Fred Wilson’s visits to Fort Berthold, see their finding aid on their papers and photographs and items they collected.